Car-free and carefree in Acadia! Want to help improve the visitor experience and natural environment at Acadia? Consider a car-free and carefree vacation to the park. There are many options for getting to and around Acadia without using your car. First: keep an eye out for any car-free mornings scheduled during your visit. They typically occur on a Saturday morning in May and September each year. Fly to the Bar Harbor/Hancock County airport (BHB). In the summer and fall season, the Island Explorer bus connects to the airport. Fly to Bangor International airport (BGR) and ride Downeast Transportation to Bar Harbor or West Transportation’s bus to Ellsworth or take a taxi. Take the bus (Concord Coach or Greyhound) from Boston to Bangor. See below for options to connect to Mount Desert Island, Stonington, and Schoodic. Boat into Mount Desert Island, Winter Harbor, or Stonington harbors. Downeast Transportation provides bus service between Bar Harbor, Ellsworth, and the Bangor airport and Concord Coach bus depot every Friday and Monday. West Transportation provides bus service between Bangor, Ellsworth, and Gouldsboro daily. The Bar Harbor/Bangor Shuttle is a private shuttle service that operates June through October on a reservation basis. Downeast Transportation provides bus service throughout Hancock County connecting in Ellsworth. For example, on Fridays, you can take a bus from Bar Harbor to Stonington via Ellsworth. The fare-free Island Explorer bus system operates in all communities on Mount Desert Island and the Schoodic Peninsula from June 23rd through the end of August. Some routes also continue through Columbus Day. There are several ferries and mailboats that connect Mount Desert Island with Schoodic, the Cranberry Isles , and Swans Island/Frenchboro. The Isle au Haut ferry provides year-round ferry service from Stonington to the Isle au Haut town pier and seasonal service to Duck Harbor in Acadia National Park. There are several local taxi companies in the area. Ride the Island Explorer. It’s fun, it’s convenient, and it’s free! Remember that all Island Explorer passengers should purchase a park pass before they board the bus into Acadia. Hike a Village Connector Trail into the park. 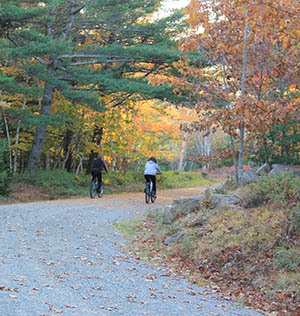 Friends of Acadia maintains connectors from downtown Bar Harbor and the Northeast Harbor Village Improvement Society maintains trails from downtown Northeast Harbor. Ride your bike into and in the park. The historic carriage road system offers 45 miles of motor-free crushed stone roads throughout eastern Mount Desert Island’s interior. All Island Explorer buses are equipped to carry bicycles, and the Bicycle Express transports cyclists from Bar Harbor to the popular Eagle Lake carriage road access point. Several area bike shops offer bicycle rentals. Please remember that bicyclists should not ride on hiking trails or on the privately-owned carriage roads in Seal Harbor. 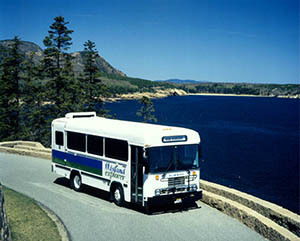 Take one of the commercial tour buses operating out of Bar Harbor.